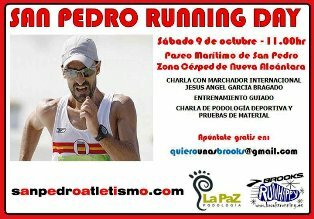 The San Pedro Sport Club is celebrating their 15th anniversary in conjunction with the XVI City Race by hosting a San Pedro Running Day 2010 on Saturday October 9. The day starts in the morning at the San Pedro Paseo Marítimo (boardwalk) with various sport activities, running race, discussions and training. A visit will be made from the international walker Jesús Ángel García Bragado. The race and activities are all free and open to any age or level. Please confirm by sending an email to quierounasbrooks@gmail.com.